Jaynes stitching tales: ABC Exchange received. 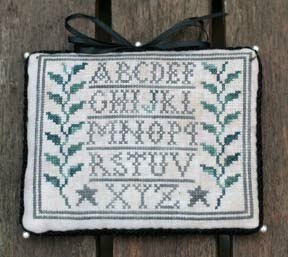 My partner for the ABC Exchange was Edgar unfortunately he had to stitch twice for me as the first one went missing in the post, it is called letters and leaves from La-D-Da stitched on 36ct linen with Variegated threads, it is beautifully finished off as a pinkeep. Oh Jayne, what a wonderful exchange gift.